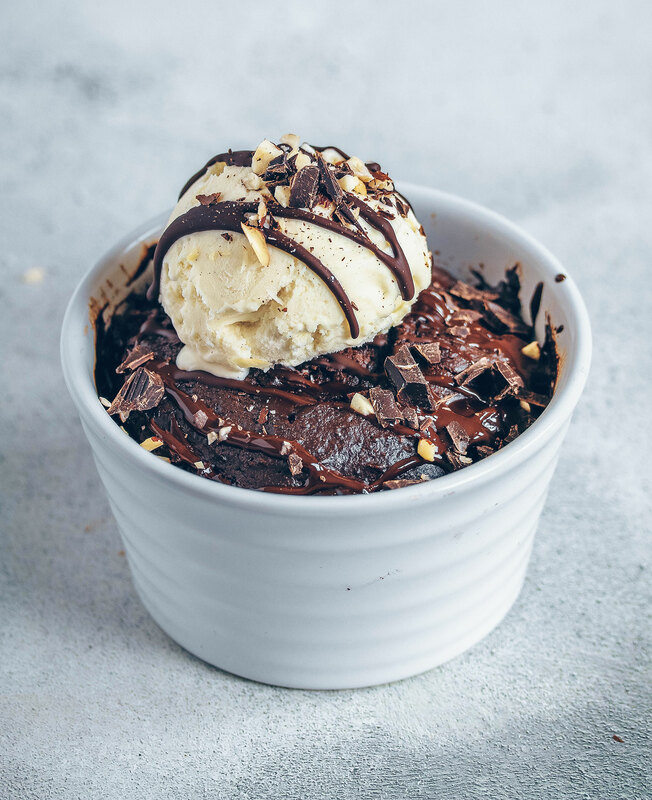 You know those times when you really really crave a slice of chocolate cake (or in my case any kind of chocolatey baked good), but don’t have anything remotely like cake in the house and wish that you had. I’m sharing a recipe that will come in handy for exactly those moments! 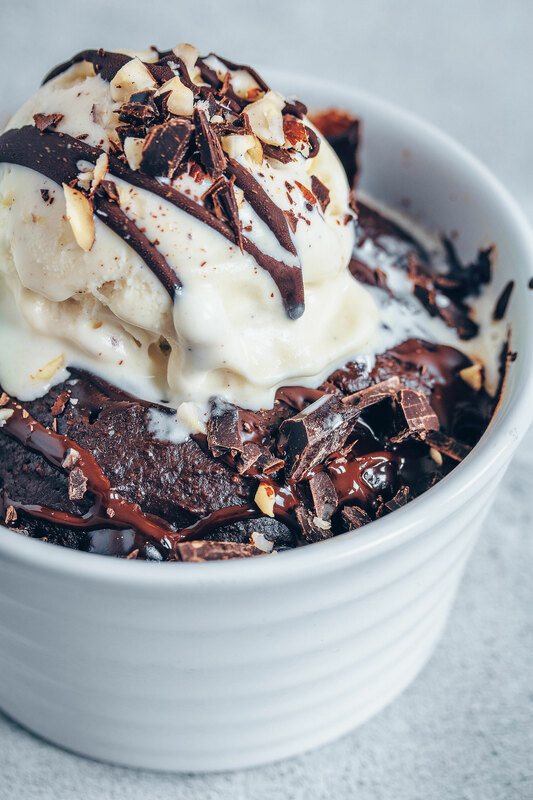 A chocolate protein mug cake that’s super rich and decadent but much healthier than a regular cake. Made with protein powder, ground almonds, cocoa, plant-based milk and almond butter. I also used a little maple syrup for extra sweetness but you can absolutely replace that with more plant-based milk instead to make it lower in sugar. For me, this is a life saver! Every now and then I just get a sudden craving for chocolate cake or a brownie. 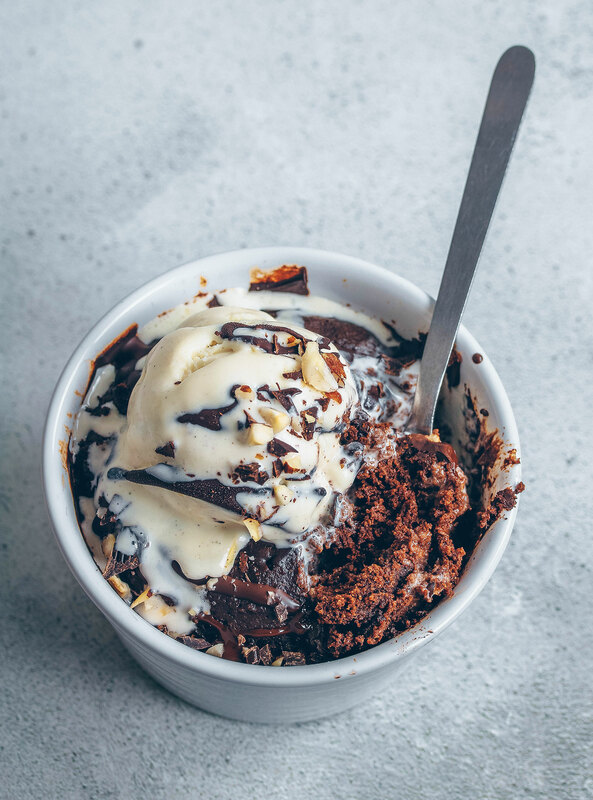 Instead of going out to buy something from the supermarket, or spending 30 minutes in the kitchen baking something, I just take out a couple of ingredients I always have in my cupboard and a bowl and have a cake ready within 5 minutes! Problem solved and craving gone! Not only does it take a fraction of the time to whip up and have ready to eat within minutes, it also means you don’t have to bake an actual full size cake. It’s especially handy if you live on your own or with you partner (like in my case) and don’t necessarily have many mouths to dish out a whole cake to! I’m taking part in Vega‘s One Tub Test to try to increase my protein and nutrient intake after I indulged over the Christmas and New Year break. 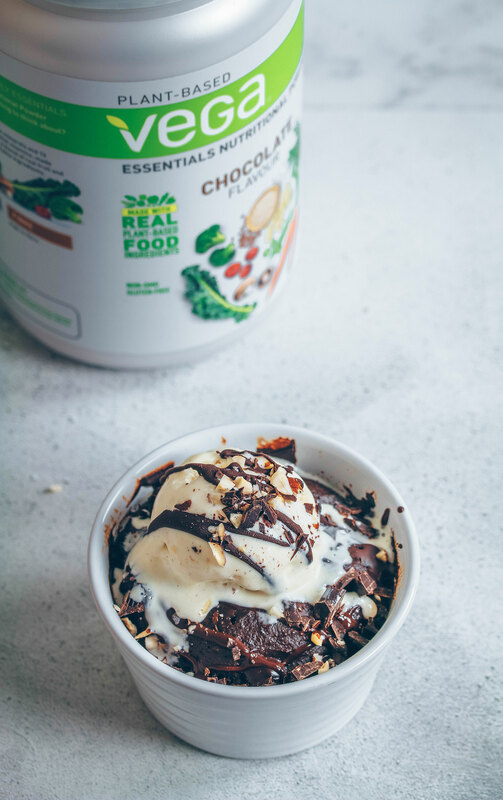 My skin, hair and digestion have been suffering and I want to see how I feel after just one tub of their Chocolate Essentials Nutritional Powder. It’s completely plant-based and high in 16 essential minerals and vitamins – including Iron, B12, Vitamin D and calcium – all made from a blend of real fruits and vegetables. The powder is made up of a blend of pea, flaxseed and hemp protein and it also contains a good amount of fibre and omega-3! Since making my shift towards a more plant-based diet (it’s been a few years now) I’ve always tired to include a good amount of protein in my diet, especially since I suffer with IBS and malabsorption due to gut issues. I can only eat small portions at meal times and tend to snack between meals because I can’t handle decent sized meals, so sometimes I struggled to eat a good amount of things like beans and tofu. The thing I love about Vega’s protein powders is that they’re an easy way to add more plants and more nutrients into my daily diet without trying too hard or having to eat huge volumes of food. As with any supplement, it shouldn’t be used as a substitute to real food, but as a convenient way to top up your nutrient requirements. So far I’ve tried Vega‘s vanilla and chocolate essentials nutritional powders and absolutely love the taste! It’s not always easy finding protein powders that taste good, and let’s be real if it doesn’t taste good I don’t want to add it to my breakfast every morning! 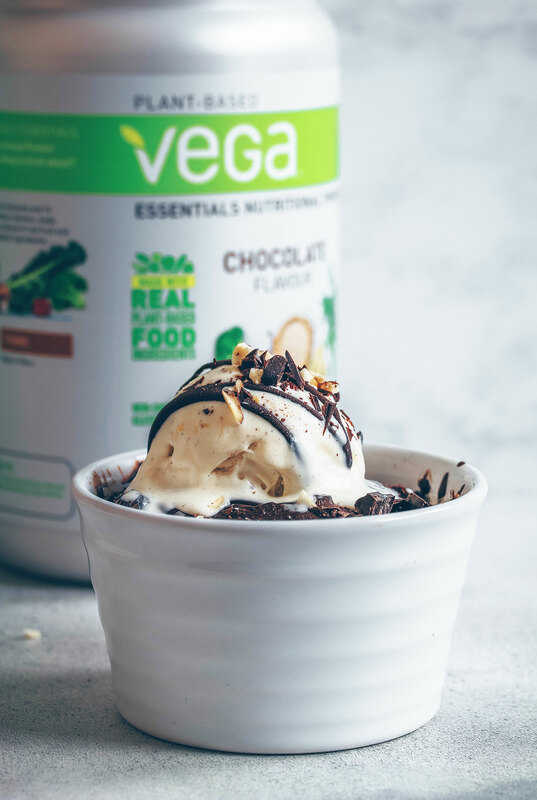 But Vega’s protein powders taste really good in smoothies, porridge and banana ice cream as well as baked goods and no-bake treats. I also use them to make wicked protein bars (recipe for which is coming soon!). 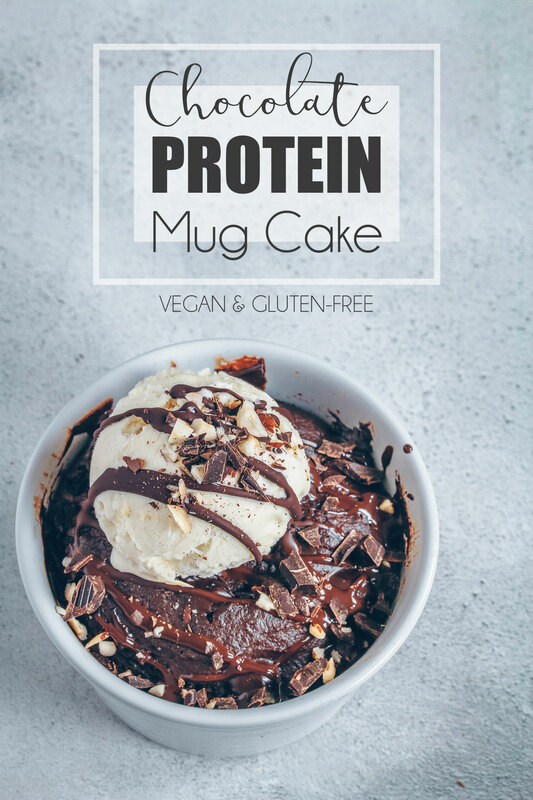 So if you’re looking for a quick treat to satisfy your sweet tooth then give this protein chocolate mug cake a try! And quick and easy to make! 1 tbsp liquid sweetener like maple syrup – if you want a less sweet/lower sugar version you can leave it out or use 1 tbsp of granulated stevia instead. Just make sure you add an extra 1 tbsp of plant milk to replace the liquid. Mix the first 4 ingredients in a bowl, then add the almond butter, plant milk and sweetener (if using any). Mix to combine, then fold in the chocolate chips. Transfer into a lightly oiled ramekin/small bowl/mug. Microwave on high for 1-1.5 minutes. You may need less time if you’re using a powerful microwave. I made mine in a 700w microwave. Leave to cool for 10 minutes. اخلط المكونات الأربعة الأولى في وعاء، ثم ضف زبدة اللوز، الحليب والمحلي. امزج ثم أضعاف في رقائق الشوكولاته. Thanks to Vega for sponsoring this post. Commissioned posts is how I’m able to continue working on the blog and creating recipes and recipe videos for you. As always, all opinions are my own. It looks rich, delicious yet good for you! 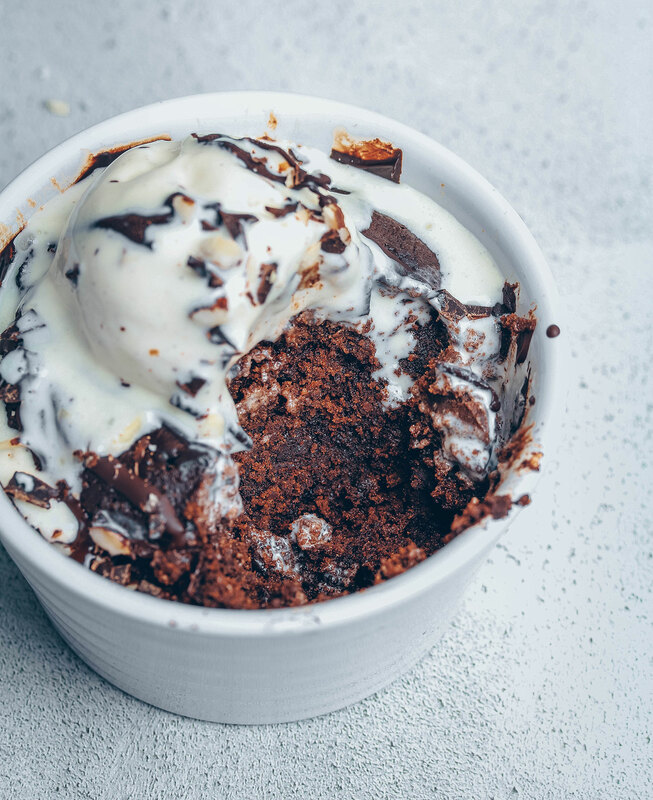 This mug cake looks so delicious Nadia ! I love it that the recipe is not only easy and quick to make but also gluten-free and vegan. Quite tempted to make this RIGHT NOW! It looks delicious and so easy! I have all the ingredients, I’m going for it! Corrr! Nadia that actually made me salivate, it looks gorgeous! 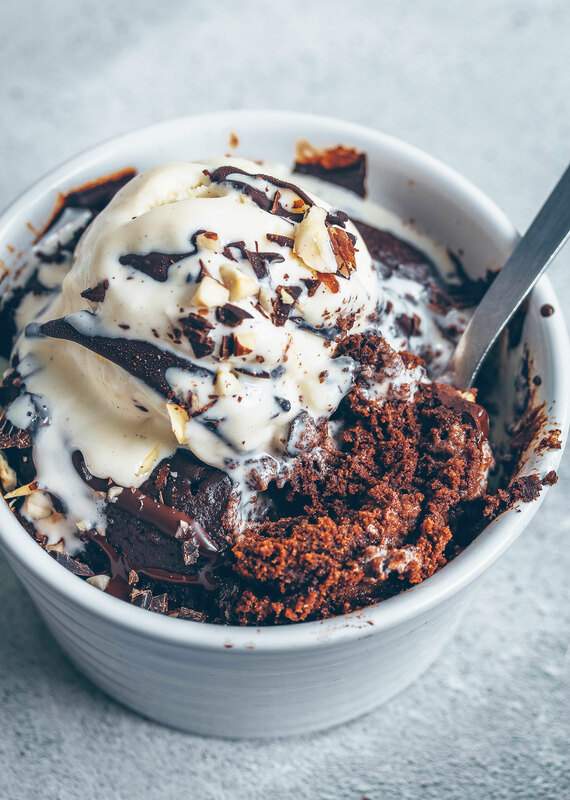 This is perfect for me; we don’t buy sweets and cakes at home, but the cravings still come – I’ve a feeling it’ll hit the spot! 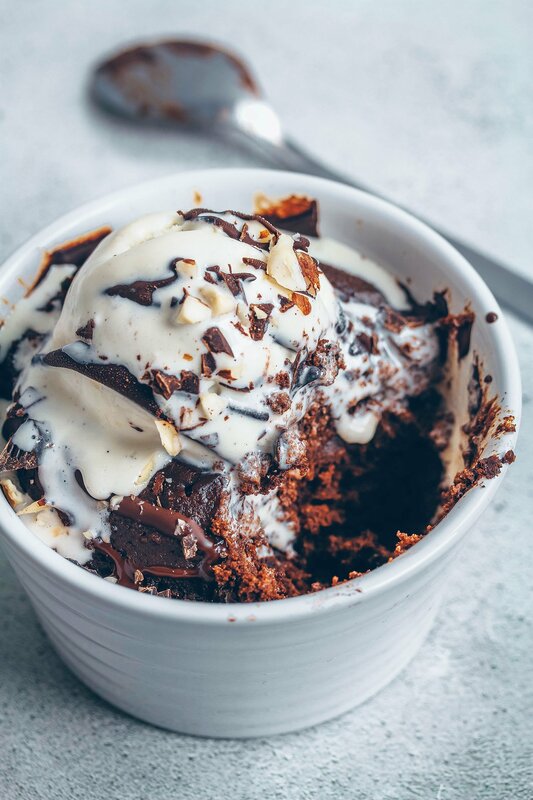 Mug cakes are so great when you need a quick pick up and yours is healthy as well which is a bonus! Looks absolutely beautiful! I haven’t made a mug cake in a long time. Might have to get on that with this recipe!